Finally we have the parent company that does have a decent amount of assets. It has 80M in real estate 155M in cash and some other assets for a total value of 260M. Total liabilities are 40M, and they do have 88M in preferred shares outstanding so that would give us a total value of 132M for the common equity, or 2.61$/share. It’s not quite a net-net with the current share price at 2.80, but it should certainly be enough to provide an reasonable amount of downside protection. The big question is: how much value do the CDO assets have? The company receives a small management fee (7M/year) for managing the assets in the CDO’s, but the true value can be found in the equity that the company has in the CDO’s. If the minimum interest coverage and asset overcollateralization covenants are met all excess cashflow that remains after paying the more senior bond holders in the CDO structure goes towards the parent company. Currently the 2005 CDO is failing the overcollateralization test by a small margin, while the 2006 CDO is barely passing. The 2007 CDO is hopelessly undercollateralized and is probably never going to generate a significant cashflow unless the commercial real estate market recovers. As of October 2011, the most recent distribution date, our 2005 CDO failed its overcollateralization test and our 2006 CDO was in compliance with its interest coverage and asset overcollateralization covenants, however the compliance margin was narrow and relatively small declines in collateral performance and credit metrics could cause the CDO to fall out of compliance. I’m not really comfortable valuing a cash flow that is so unpredictable and has such a thin margin of safety. Indaba Capital Management, a small hedge fund that has a big position in the preferreds, values the cash flow with a multiple between 2x and 4x giving the finance division a value between 73 and 180M and the common equity of the company a value between 204 and 359M. Compared with a 140M market cap right now there certainly seems to be a good amount of upside, and the downside is well protected thanks to the assets at the parent level. The problem is that the future cash flows are very uncertain: buying GKK should probably be viewed as buying a very cheap option on the performance of the CDO’s. If the CDO’s fall completely out of compliance the finance division probably starts making ~11M in losses/year (18M in SG&A minus 7M management fee). The realty division should be making roughly 6M/year, so in a worst case scenario the company will probably start losing some money, but nothing big. Despite such ample liquidity, the Company has not paid the accrued quarterly dividends on the Preferred Stock pursuant to the terms of such Preferred Stock for three years, which as discussed above, will total approximately $21.5 million as of September 30, 2011. We note that the Company also declared in its Quarterly Report on Form 10-Q filed on November 8, 2010 that it did not know when or if it will pay future dividends, including accumulated and unpaid dividends on the Preferred Stock. This declaration was in language identical to the statement in its 2010 Form 10-K which was filed on September 23, 2011 except that, in its November 8, 2010 filing, such statement was prefaced with “[g]iven our current financial condition” (emphasis added). It comes as no surprise to us that the Company did not include such explanatory language in its recently released 2010 Form 10-K given that the current financial condition of the Company is substantially improved from its condition in November 2010. We believe the Company is now sufficiently restructured and capitalized to pay all of the accrued but unpaid dividends on the Preferred Stock. According to our above estimates, such accrued but unpaid dividends represent only approximately 10% to 13% of the Company’s cash holdings. The question is of course how successful they will be. If we let the actions of the management speak there is little reason to believe that they are planning to reinstate the dividend. And while the dividends are cumulative, no interest is paid on the accrued dividend so the preferreds are becoming an increasingly cheaper source of funding for the company (instead of 8.125% they are now effectively paying ~6.4%, and that rate will only go down – and this is at the expense of the preferred holders). On the other hand why would management want to screw over the preferred holders by withholding the dividend? The lack of a dividend is almost certainly also depressing the value of the common. The company also can’t continue to not paying the preferreds. The company is a REIT and is by law required to distribute taxable income as dividends, and it can only pay dividends if the preferreds are paid. The company is posting positive earnings for the past nine months, but I’m not sure when they actually have to start paying taxes. They did of course suffer big losses in the past, and those can probably be used to delay paying tax. When I initially read the case for GKK at Whopper Investments I thought that it was a pretty good idea, but reading and thinking about it more I’m not so sure anymore. What do you think? This entry was posted in Research and tagged GKK, GKK-PA on December 12, 2011 by Alpha Vulture. But I couldn’t figure out from the restated pro forma statements how they got these numbers. 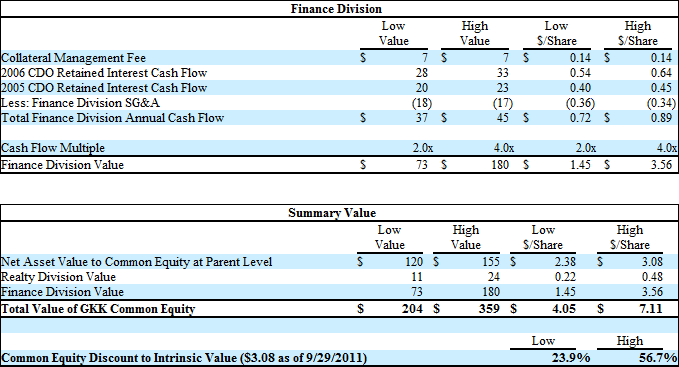 In the Sept 2011 P&L, SG&A is 24m (for nine months). That’s 32m for a year. And there are all the other “property operation expenses” and interest payments. Why are these cash expenses not counted in calculating the cashflow? Do you have any idea? Indaba’s valuations aren’t based on the pro forma statements since those are just available. SG&A is probably a bit higher related to the costs of cutting off the realty division. Hard to say since they don’t split it out in the pro forma statements. The big interest payments are afaik payments for the money that is borrowed for the creation of the CDO’s, so this is not at the parent level of the company. To create a CDO the company puts up some money, and borrows the rest at a a low rate. What actually should be worth checking is when exactly the CDO’s will be wind down, and if the company will get back some money. And I would guess that the property expenses aren’t counted because those are implied in the value of the property. The properties should be able to generate enough cashflow to cancel out the operating expenses. But haven’t really looked into this.